I wonder what the media’s reaction will be to the next reporting inquiry. This deals with the question of how well the university reacted to freedom of information requests. I suspect there may be some negative findings there. It will be rather sad if the media decides to make a feast of that after ignoring the inquiry findings that showed no scientific misdemeanors. (Reminds me – must watch the media 7 coverage which I have downloaded). Of course, last week’s Media7 gave over its whole show to this issue and even had The Guardian’s environment editor James Randerson patched in from London. 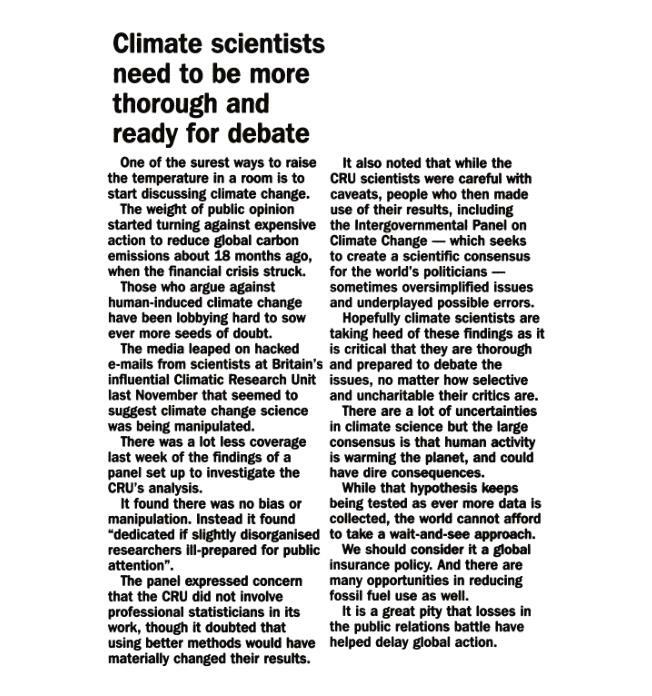 So good coverage there, but it pretty much stands alone and while there were numerous newspaper editorials around the time of climategate suggesting the credibility of climate science had been dealt a blow there has been nothing from the papers, bar this editorial in the Gisborne Herald, following up the story.